Cliff Richard - "The Countdown Concert"
In 1999, Cliff Richard invited much company to another major event. 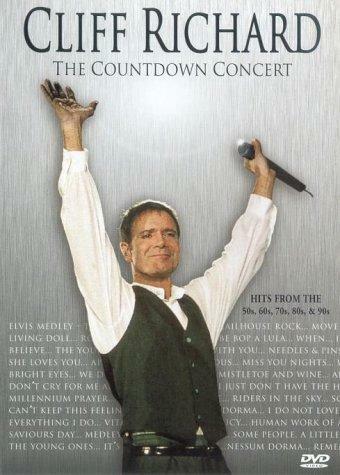 The “Countdown Concert” took his audience on a time travel through five decades of pop music and pop history. Accompanied by a group of dancers he presented hits like “Move It” and “Living Doll” as well as epochal references like “Rock Around The Clock” and “Be Bop A Lula”. The ramble through the decades brought out many highlights, for example an Elvis-medley, “She Loves You” from The Beatles, “Needles And Pins” and “I´m Nearly Famous”. The singer Russel Watson enters the stage for “I Believe” and “Nessum Dorma” and Richards` long-time companion, Hank Marvin from The Shadows, plays the immortal instrumental-hit “Apache” as well as deeply impressing versions of “Don`t Cry For Me Argentina” and “Riders In The Sky”, highlighted by the groovy guitar sound of The Shadows.